There was a time that (now Dropbox-owned) Mailbox was the swankiest email app in the App Store and, while it quickly passed 1 million downloads within six weeks of launch, a number of equally as nifty competitors have arrived en masse, including Dispatch. Launched June 4, it’s an “action-based” email app that helps take you to inbox zero via your iPhone, iPad or iPod touch. 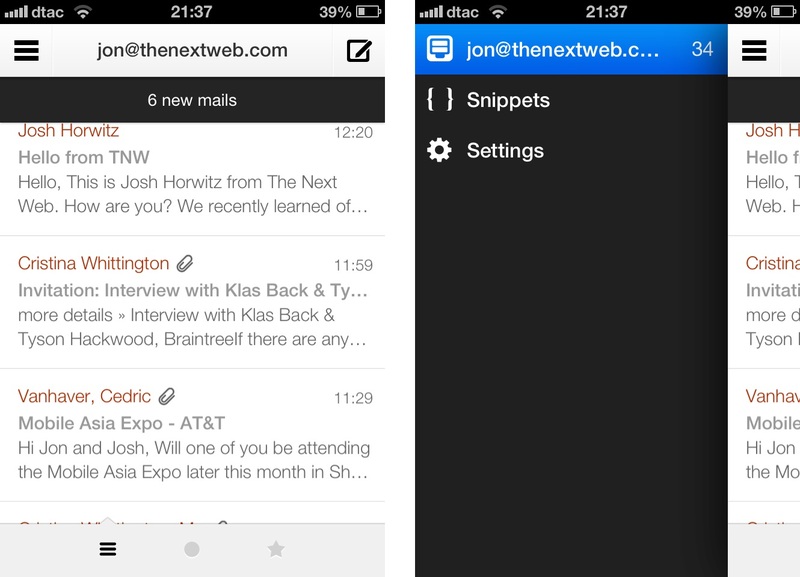 Developer Clean Shaven Apps says Dispatch is compatible with Gmail, iCloud, Yahoo! and AOL email accounts only, but it appears to support all IMAP-based email services. Dispatch’s real strength is its support for 14 other iOS apps — Safari, Chrome, 1Password, Maps, Google Maps, Instapaper, Due, OmniFocus, Things, Calendar, Reminders, Asana, Drafts, Evernote — but it’s adding to that tally today. There are plenty of shortcomings with Dispatch, as Clean Shaven Apps readily admits, and that includes no support (or plans for) push notifications or POP/Exchanged-based email. Equally, for now, there is no search, folder support, syncing of drafts or the ability to attach multimedia. Yet, there’s still a lot to love about Dispatch. For one thing, the interface is seriously slick. The basic UI is functional and works well — let’s not complicate email — operating in a Mailbox-like fashion. Swiping left on an email lets you mark as unread/read, star, archive, mark as spam or delete; while the long-swipe can be customized. In addition, the option to undo an action flashes up for up to five seconds, helping to fix any mistakes. Right swiping takes you back to the previous screen — so back to inbox when inside an email, back to settings when inside inbox, etc. Where Dispatch comes into its own is the ability to add pre-defined snippets, which speeds up replying to specific types of emails — for example customer support or acknowledgements of receipt. That works nicely when combined with support for Evernote, Asana, Calendar, Reminders and other productivity services. This is actually the raison d’être for Dispatch. When travelling across Japan Junjie Lin told his friend (and soon-to-be co-founder) Hon Cheng Muh that he wished he could respond to emails using TextExpander: then the concept of the app was born. Dispatch supports snippets from TextExpander as well as its own predefined and customizable ones — such as: an address, signature, passport details, etc. However, it doesn’t yet include support for fill-ins (e.g. auto-creatable times and dates) which could make it even more useful. These strengths — coupled with its self-admitted weaknesses — makes it an ideal and lightweight app to manage the flow of a busy inbox while on the go, though a secondary service is necessary for anything more sophisticated. Personally, I’ve found Dispatch to be more than adequate to handle email on the go, a time when I need to help clear the load, to the point that it has taken over duties from Mailbox on my phone. While we’d love to make an iPad version of Dispatch, it is still too early to say for sure if we’d be making one. The real negative is that the app is no longer on offer after launch. The price tag has risen from $2.99 to $4.99. But, if you’re someone who often manages email on the go (particular if that entails mass zapping/blasting/deleting) then Dispatch is definitely worthy of consideration.